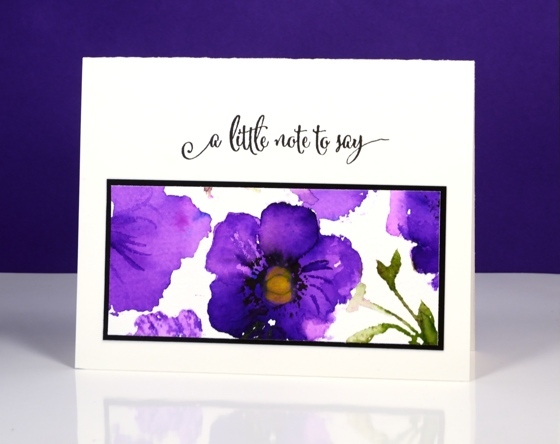 It’s the poppy pattern stamp’s turn to be featured today. I have a variety of colour schemes but only two mediums. The most subdued version is the one above done with forest moss, worn lipstick and scattered straw distress stains plus a black marker to add definition to the poppy centres once the stains had dried a little. I used a MISTI to add colours one at a time. 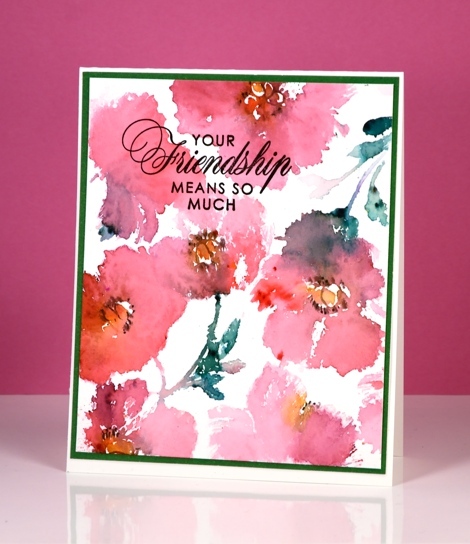 The remaining cards were all done with colour burst powders dropped onto water stamping. You lose a lot of definition with this technique but you achieve some gorgeous bold colours and in some cases some magical blending. Above I used phthalo green, lemon yellow and merlot (I think). Below it was probably alizarin crimson. The bright purple panel below was the one section I saved from the large stamped image. I stamped it with water but when I went to sprinkle violet colorburst powder I got a little more than I bargained for. I let it dry, then chose one section to touch up, trim and turn into a card. Beautiful cards I just love your techniques! With the color burst powder, do you spritz the water onto the stamp, stamp it on paper then add the powder on the paper? Wow! Among your best cards ever, in my opinion. I’m tempted to come to Ottawa for a class so your techniques can rub off on me, but it’s a long way off. 😊 Just beautiful. And it’s the kind of art I like to do. Thanks so much. These are lovely, Heather! And all so different, yet beautiful!! Reblogged this on Spreading Sunshine with Paper & Ink. Beautiful cards . Can you explain what — stamped with water means ???? I either spritz the stamp with water or paint it on lightly with a paintbrush then stamp it on watercolour paper. I then lightly sprinkle watercolour powder over the stamped image and it reacts with the water giving me a loose but pretty blended image. Once it is dry I shake off the excess powder. Messy but fun! You always seem to remind me to Cherish that Poppy Pattern stamp. Your cards truly show how versatile it is!! Each card is a jewel….what wonderful colors!!!! Thanks so much for sharing Heather – you always inspire me to try new things! My favorite is the very first one with the soft pink. But then the one with the bold purple is my 2nd choice. So fun with the different looks you can get. 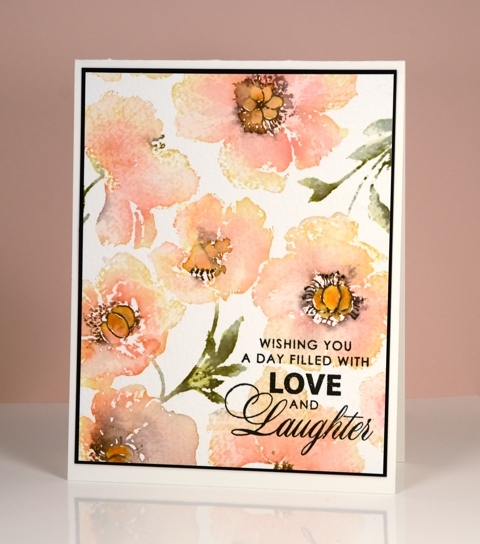 Gorgeous cards, Your stamping and coloring is awesome! Absolutely beautiful cards, Heather! I especially love the first one with its soft colors! Stunning each one!! Hugs, and Happy Mother’s Day! A video would be awesome! Please? It is all in the technique and mine turned to “mud”. Not very interesting but I am still working on the right touch! TFS Your cards turn out stunning each time. All content is © Heather Telford and is for personal use only and may not be copied for publication or contest submission.